that our brother brought to our family. I know I can never be Flora,who always have the right words to give the world,but I can not help but give the voice of our dear parents whose desire was to give Paete another Doctor as Dedicated as Dr.Wilpredo Baisas. TO ALL,OUR HEARTFELT THANKS,TO ALL THE SILENT HEROES THAT ONE WAY OR ANOTHER HELPED<CONTRIBUTED TO HIS SUCCESS. THIS IS ONE OF PAETE'S LEGACIES,THE ROOT WE INHERITED FROM OUR ANCESTORS......OUR SACRIFICES PAID OFF.<WITH THE HELP OF OUR LORD. Posted: Fri Sep 13, 2013 8:28 am Post subject: Congratulations! Congratulations Dr. Navarro! Your family, friends and kababayans are mighty proud of you. Inang Flora N. Filoteo must be beaming with pride and joy looking down from up there. Conratulations to you Dr. Teodoro Navarro for getting the Best Doctor Award. This will b historical since this si the the very first time it was given and a Paetenian got it, Congrats again. Congratulations Ninong Dodo!!!! Well deserved! Congratulations to a kababayan for a job well done! 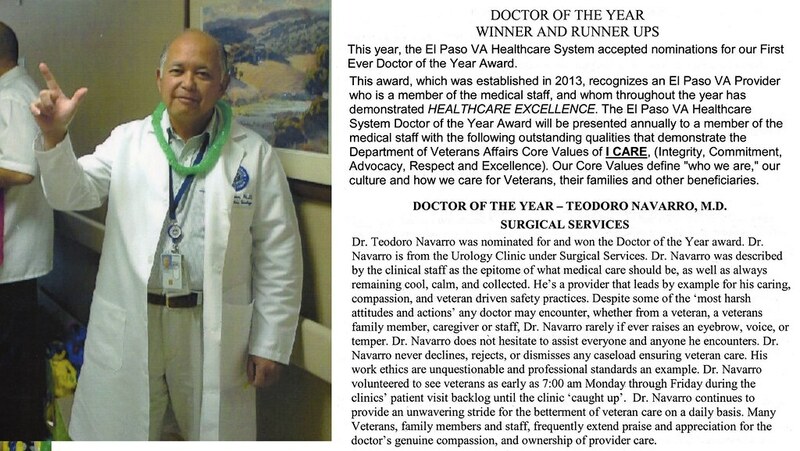 CONGRATULATIONS, DOCTOR OF THE YEAR: DR. TEODOR0 NAVARRO! Paete's pride and honor, truly deserving! Congrats, too to the women behind your success, 'Mareng Dolly Aguinaldo-Navarro and Thea. Posted: Mon Sep 09, 2013 8:56 pm Post subject: Congratulations! Congratulations Pare! You really deserved it!